are never edgy or hashy and always highly listenable"; "non-existent in a sonic sense" -- meaning they disappear. Features Small size and eye-catching looks; high rated efficiency means the system wont require a high-power amplifier; optional stands cost $149 and mate well with the speakers sonically and visually. Use Easy to place for good sound; worked well in A/V system and music-only audiophile rig. Value "An ideal balance of style and substance" thats the best speaker system of its type Doug has heard. Anthony Gallo Acoustics has been building some of the coolest-looking speakers for quite some time. Originally based in New York City, Gallo turned audiophile heads some years back with the innovative Nucleus series of spherical speakers and their proprietary CDT tweeter. However, consumers should take note that although the modern, spherical look was visually appealing, it was really a design consideration. The company feels that the round enclosure has inherent superiority over traditional box enclosures. According to Gallo, the sphere has no internal standing waves and no external baffle diffraction. They are also very strong and very light, eliminating energy storage and thus harmonics and ringing/time and phase distortions. I first heard the original Nucleus at HI-FI 96 and was impressed with its open, airy sound and impressive detail, dynamics, tightness and control. Gallo Acoustics was successful in its appeal to the audiophile market with a number of speaker models. They could have kept doing what they were doing, but keen eyes noted that the distinctive appearance has appeal for a much broader range of customers. So Gallo embarked on its most ambitious project since originally launching the company. They ceased production, for the time being at least, of their then-current line of audiophile speakers (the Nucleus Solo and Nucleus Reference), moved production and distribution to California, and bulked their company up to compete head-on in the important consumer market that values fine styling and value along with good sound. The potential in a market such as this is huge, but it is not an easy one to crack since it is currently dominated by very few, very large companies with a huge presence at the retail level. To compete in this league takes, as some would say, balls. Luckily, Gallos got em. The Nucleus Micro loudspeaker system took five years of development. After exhibiting at numerous consumer shows over the past couple years, Gallo began shipping the Micro system in mid-1999. The system consists of a round pair of diminutive satellite speakers, 4" in diameter, and a single round passive subwoofer that is about 10" in diameter. The trio of spherically shaped speakers is made from metal and durably finished with a powder coating. They form a near full-range loudspeaker system capable of room-filling sound that occupies very little space. The total price is $699, which includes all three speakers plus all wiring to connect them to your amplifier or receiver and rubber rings for placing them on shelves or, in the case of the subwoofer, on the floor. They are available in black and white finishes now, with wine, champagne, stainless and bronze available by January 2000. The satellites are solid little units that fit in the palm of your hand, each using a single 3" driver for all upper bass, midrange and high frequencies. If you wish to buy the satellites separately, they retail for $300 per pair. Optional floor stands are available for $149 per pair and attach behind each speaker. They lift the satellites about 36" off the floor to proper ear level. Unless you have no need for the stands (for example, if you place the speakers on shelves or your TV set), consider the stands mandatory. They look very good, take little space and finish the speakers off beautifully. The satellites also have a 1/4 20 threaded insert built in, so that they can be wall mounted using standard brackets available at most dealers and chain stores. The enclosures are finished to a very high standard and have rear-mounted binding posts of good quality. Gallo supplies solid-core copper wiring that attaches to the binding posts on the back of the speaker and runs to the subwoofer. The wire tucks neatly into the optional stands tube, taking it away from view near the speaker. The passive subwoofer is an impressive unit designed to sit directly on the floor. It uses an 8" dual-voice-coil woofer from Peerless and also contains the crossover for the satellites. The crossover frequency is 120Hz. This is the only crossover point the speaker system has, meaning that crucial midrange frequencies, where vocals are for example, have no crossover points as they would in speakers with separate tweeters. There are no controls on the subwoofer, simply binding posts on the back for connection to the satellite speakers and another set of posts for the wires that run to your receiver or amplifier. You can run the satellites directly from an A/V receiver if you set the receiver to "small enclosure" or cross at 120Hz; otherwise, you should connect them to the subwoofer, which shelves the frequencies below 120Hz for the satellites, so they are not forced to deliver the low frequencies. Gallo plans to introduce a powered subwoofer, presumably targeted for home-theater use, in either late 1999 or early 2000. Gallo rates the subwoofer down to 32Hz and the whole system up to 18kHz. They spec the sensitivity at a highish 92dB. Gary Pelled at Gallo says that a minimum amplifier power of 15Wpc should be used, and no more than 100Wpc is necessary. Providing the high sensitivity specs ring true, this means the system will need very little power, just a few watts, to get them singing at an appreciable level and then not much more to get them playing loudly. Listeners should have very pleasing results with amplifiers rated from about 30 to 60Wpc. I would, however, not necessarily place these speakers in a very large room or recommend them to people who like to play their music excruciatingly loud, but they are excellent in small to medium-sized rooms for people who play their music at sane levels. The Micro system is the perfect apartment speaker -- and for a modest price. Whats more, low-power electronics, even tubes, will mate quite well. Due to the systems diminutive size, setup for good sonic performance is a snap. I ended up placing the satellites about six feet apart and a couple feet from wall boundaries. I also found that they could be used quite effectively in close proximity to walls without diminishing performance to any great extent. Gallo recommends corner placement of the subwoofer, but for almost all of my listening, the sub was placed dead center between the satellites. I gave the Micros a television and movie break-in period. That is to say I hooked them up to my video system and played hours of MuchMusic and watched a number of movies with them (in stereo of course). Then I moved to the serious music. For most of my listening I used a modest system consisting of the Nakamichi AV-10 surround-sound receiver (I used only the left and right stereo outputs to the speakers) along with a DVD deck from Kenwood used as a CD player. While not necessarily reference-level electronics, they sound good and are likely indicative of the price range of equipment that many prospective Micro buyers will use. For my final listening, I went for overkill and moved the Micros to the reference system valued at over $25,000. This is made up of Theta digital components (Data Basic transport and Pro Prime II DAC) and Blue Circle Audio electronics (BC3 Galatea preamplifier, BC2.1 mono amplifiers) connected with Nirvana S-L interconnects and speaker cables. After sufficient break-in and warm-up I started with a movie soundtrack that I enjoy immensely: Leaving Las Vegas [Pangea 72438 36071 29]. Leaving is a great movie with a great music soundtrack thats well recorded. The title track opens with Bens (Nicolas Cage) final words to his boss as he get fired: "I thought Id move out to Las Vegas." After Cage speaks, a jazzy piece begins with percussion, keyboards, sax and trumpet and a persistent cymbal that adds wonderful high-frequency shine. The song has a light, airy sound with plenty of space and depth. Its recorded quite cleanly and has lots of detail and some nicely placed background vocals. The Micros nailed it, portraying the same type of spacious, breathy nature that I hear with other really good loudspeakers. The drum attack was quick and impactful, if not quite as full and forceful as bigger, more expensive speakers can muster. It did have similar tightness and control though. The highs were nicely resolved, but had just a tad less extension than the best tweeters, but were very good for the price. Importantly, the speakers never suffered from the edgy, hashy nature the way some lower-priced speakers do. The use of a single driver versus a separate midrange and tweeter makes the speaker a tad more forgiving, and this can be a good thing on brittle recordings or with less-than-pristine electronics. The second track from the same disc, "Angel Eyes," is sung by Sting and is a good recording of male vocal. Its a brooding piece with double-bass and piano accompaniment. The Micros resolved the voice and instruments with proper weight and impressive detail. There was not a resonant or chesty character to the sound that Ive heard with some speakers in poorly constructed box cabinets. Again, the small subwoofer does not plumb the depths and fill a big room like much larger units, but it fleshes out the bottom end more than adequately -- and, most importantly, does so with control and detail. This track also showed that the satellites and subwoofer integrate very nicely and sound like a cohesive, single unit, unlike many subwoofer/satellites that do not blend all that well. In this same audio/video system, I have been using the Audio Specialiste V-303 loudspeakers ($629) that are designed for music and home-theater use. The V-303 is a much larger floorstanding speaker in a more traditional MDF cabinet. For their price, I have found these speakers to be very good in their dual role for music and video and have, as a result, listened to a lot of music through them. They can do crashes and explosions for movies very well, but also show the finesse and detail that audiophiles want for music. This speaker is an excellent example of a contrast in style and sound with the Gallos. Both are excellent values, but look very different and play music much different ways. In terms of output, the V-303 speakers can certainly play much louder with their dual 6" Vifa woofers and have more impact in the bass, but they dont necessarily go deeper (at least at moderate volume levels). However, when it comes to other aspects of performance, each speaker had merit, and the Micro system proved itself to not necessarily be a high-output performer, but rather one with excellent refinement and finesse. The Gallo subwoofer cannot play as loudly as the V-303, but it is tighter and boogies a little better. Although detail is comparable with each speaker, the V-303 sounds more chesty and resonant, which is most noticeable on vocals. As well, the single drive unit in the Micro satellites makes voices sound surprisingly real and with an almost you-are-there touchability. The Gallos do a much better disappearing act and have a better-defined stage in terms of width and depth as well as greater overall spaciousness. In fact, this has had many scratching their heads when they compare the size of the two speakers. For those who like music loud and are fans of rock and its many derivatives, the V-303 is perhaps a better choice because it can competently play virtually anything at volume levels just short of ear-splitting. Its also a better speaker to fill larger rooms. However, when you factor in the impressive appearance, small size, and a very refined sound within its limits, the Gallo Micro system wins hands down. I then moved the Micro system into my reference stereo system with the high-priced gear. While moving the speakers into that room I found a side benefit of having such small speakers: you can move each speaker with only one hand, a feat bordering on impossible with almost all other audiophile speakers. Setting them up was once again a snap, and I was going in no time. The first disc I played, Mobile Fidelitys remaster of Don Henleys The End of the Innocence [Mobile Fidelity UDCD 721], sounded extremely good. Part of the reason is that compared to the standard release, the MoFi version is much cleaner and smoother and worth owning for fans of the disc. On top of this, the Micros made it shine, displaying excellent clarity and detail. Some speaker fine-tuning, in terms of placement, resulted in a very open and spacious sound with an excellent soundstage, just like I had with my A/V system. I found that the Micros dont necessarily "cut out" images in the stage like some other speakers do. The NSM Models 5 ($385 per pair) and Model 10S ($895 per pair), for example, both throw a huge stage with pinpoint specificity and razor-sharp outlines. Instead, the Gallo speakers are more spacious-sounding, with excellent width that sometimes extends beyond the speakers and surprisingly good depth for the price. They also disappear so completely that its extremely difficult to pinpoint the satellites as the source of the sound. "Pacing the Cage" from Bruce Cockburns The Charity of Night [True North TNSD 0150] is an excellent track thats very rich-sounding and has notable separation between the musicians. On this particular track I listen for three things: (1) Cockburns closely miked vocals are recorded very cleanly and with good detail, but are thick and woolly sounding on some speakers that are poorly damped; (2) Rob Wassermans bass is detailed and follows very specific lines that are tight and tuneful, but they get muddled and confused on lesser speakers; and finally (3) Cockburns acoustic guitar shines with pristine clarity and detail that can sound either bright and edgy or dull and lifeless depending on the speakers particular character. The Micros are very tight and tuneful and rendered the voice and bass guitar with excellent definition and attack. Some other box speakers Ive tried near this price are more resonant and chesty-sounding if their enclosures are not effectively damped, a problem the Gallos dont suffer from. Finally, the high frequencies of the Micros are not quite as extended into the stratosphere as some of the really good minimonitors Ive tried (the NSM Model 10S, for example), but neither did it lose any of its life. They sacrifice a bit up top, but to their credit they are never edgy or hashy and always highly listenable. The overall sonic performance of the Micro system is extremely good at the price with three aspects that impressed me much more than I anticipated. With some systems at this price point, both with and without separate subwoofers, the bass can be deep, but is often indistinct, underdamped and woolly. The Micro system subwoofer integrates extremely well with the satellites and sounds tight, fast and controlled. The speakers cannot necessarily rock the house down and wont fill a very large room, but within their limits they can really shake their bottom end and boogie with excellent rhythm and drive, which bring realism to the music. Second, the speakers are obviously tiny, but they disappear even further when playing music -- basically, theyre non-existent in a sonic sense. Its amazing enough to hear so much music come from such a small sphere, but whats more impressive is when its hard to tell where the music is coming from at all. They throw a surprisingly big stage with good width and depth. Most of the time it is impossible to tell the source of the sound as the satellites and the sub. Finally, these speakers render vocals with surprising realism and clarity. There is not a hollow, wooden, boxy or chesty sound that plagues some lower-priced speakers. Instead voices leap from the spheres with realism. Gallo boasts of no crossover near the vocal region, and perhaps thats the reason the Micros do so well with vocals. 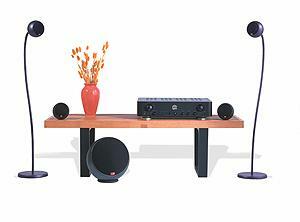 Anthony Gallo Acoustics has achieved an ideal balance of style and substance with the Micro system. Undoubtedly there are going to be audiophiles who tweak these speakers with their own wire and will likely even try using a second sub for stereo sub-woofing and maybe even a second set of satellites. However, I dont think this is really the target market at which this speaker system is aimed. The Micro system is sonically refined and looks splendid too. It's versatile, a snap to set up, and so small that the satellites and subwoofer can be readily hidden from view. The build quality is high, and the metal casings are much more durable than those of speakers constructed from wood. Finally, and most importantly, the Micro system shows its audiophile heritage with its good sound. When Gallo embarked on the mission to create an attractive speaker system, they never forgot that it needed to sound good -- this cant be said for some of the other nifty-looking but poor-sounding speakers Ive seen and heard in some of the mass-market stores. The Micro system is the best-looking and -sounding speaker system of its type that Ive auditioned and is certainly one that will put some manufacturers on their toes. Given all this, its not surprising then that it gets almost the same response from people who see it in my listening room: "Where can I get a set of those?" Price: $699 USD ($149 USD for stands).